Effortless and ethereal, this casual chiffon wedding gown from Aime Couture is a lace and tulle dream! A completely modern style, the neckline of this lace over French tulle bodice is high, but features cutouts and peek-a-boo detailing, giving it a flirty element. From the waist, the soft and airy column skirt extends effortlessly to the ground into a sweet train, ideal for a casual, outdoor ceremony! 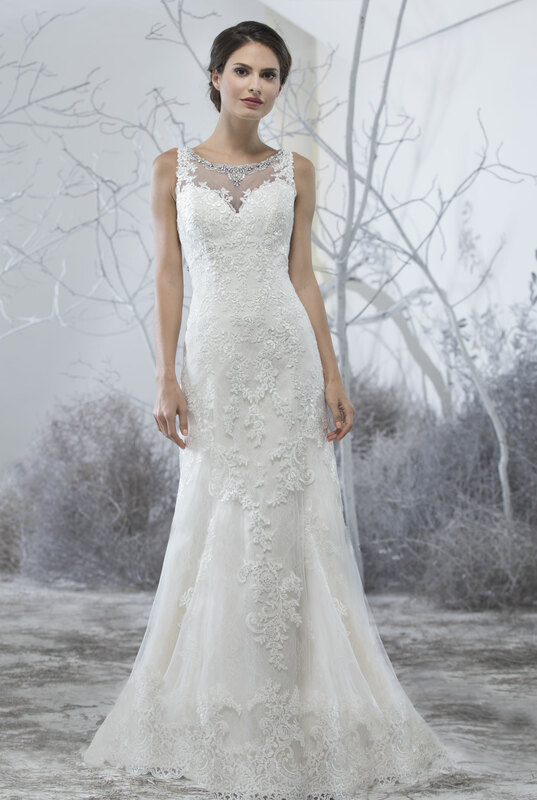 The back of this gown features a unique lace racerback design that complements the effortless feeling of this gown perfectly. This airy chiffon boho wedding gown zips up.